The palmistry compatibility calculator makes the palm reading process easy for you. The Aries man and Taurus woman are both ambitious and when they come together they can make anything work. 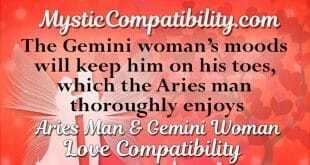 The Gemini woman’s moods will keep him on his toes, which the Aries man thoroughly enjoys. 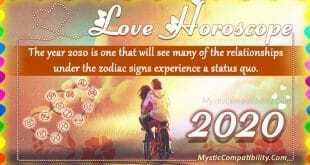 Aries man and Cancer woman are in a one of a kind, gentle, warm and romantic relationship. 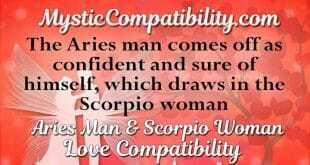 The Aries man has a lot of confidence that the Leo woman finds totally alluring. The Aries man thinks about the next adventure and the Virgo woman focuses on romance and the supportive relationship. 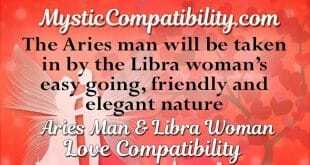 The Aries man will be taken in by the Libra woman’s easy going, friendly and elegant nature. The Aries man comes off as confident and sure of himself, which draws in the Scorpio woman. Sexually, the Aries man and Sagittarius woman are smoking hot and totally uninhibited. The Aries man Capricorn woman love compatibility couple are ambitious and goal orientated. 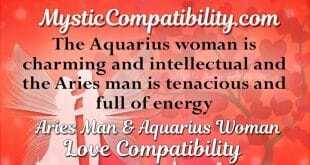 The Aquarius woman is charming and intellectual and the Aries man is tenacious and full of energy.